Anaerobic exercise utilizes two of the three human energy systems: the ATP-CP system and glycolysis. Simply put, anaerobic exercise consists of high intensity activity in short bursts of time that does not require additional oxygen. This is unlike aerobic activity, which does require additional oxygen. Anaerobic exercises typically last one to three minutes, with the most intense of these activities only lasting closer to mere seconds. The body simply cannot store enough ATP-CP (Adenosine Tri-Phosphate - Creatine Phosphate) to sustain the anaerobic activity beyond more than a few seconds. When glucose is burned during glycolysis in an anaerobic state, lactic acid causes "the burn" that forces many exercisers to stop and recover after a few minutes of activity. Full-out bursts of energetic movement at maximum intensity are anaerobic when they have so much effort, they can't be sustained beyond a few seconds correctly. In order for weight lifting to be anaerobic, the lifting should be heavy enough to where one rep is the maximum that can be done while maintaining correct form. Performing multiple reps of a lower weight doesn't fall into this category. Essentially, if the weight lifting is easily done, it's more likely aerobic than anaerobic. Running at maximum effort for just a few seconds is an anaerobic activity, but only if it is actually as fast as possible and with the most effort the runner can muster. The sprint should be so taxing that the runner cannot go any farther. Bursts of energetic movement at maximum intensity when coupled with moments of recovery or rest can still be anaerobic depending upon the energy system utilized to fuel the activity. This type of exercise often leaves people feeling sore in their muscles a few days following the activity (referred to as delayed onset soreness) as a result of the lactic acid released during glycolysis. Soccer is a good example of anaerobic activity that couples bursts of maximum effort with less effort and then back to maximum effort again. As a player, you're not participating in much activity when away from the ball, but activity gets very intense when you are actively engaged. The short bursts of maximum effort are when glycolysis occurs, burning glucose. Gymnasts frequently expend glucose during the maximum effort portions of their routines. This is true under a number of different gymnastic activities, particularly ones with single, sudden bursts of activity like the vault. When gymnasts are putting forth the most effort possible, they are in an anaerobic state. Swimming, depending upon the intensity, can be anaerobic as well. A high intensity swim with a full effort lasting no more than a couple minutes can be anaerobic. Swimming is a good choice for exercisers who need a no-impact anaerobic activity. The stop-and-go high exertion intervals in tennis prompt an anaerobic state. Keep in mind the entire game of tennis is likely not anaerobic, but only the brief portions of maximum effort. Tabata, a form of high-intensity interval training (HIIT), is a great example of interval work that combines aerobic and anaerobic. The format of 20 seconds at absolute maximum effort activity followed by 10 seconds of recovery, repeated eight times, can lead to glycolysis and the burning of glucose. Tabata is appropriate for more advanced exercisers. 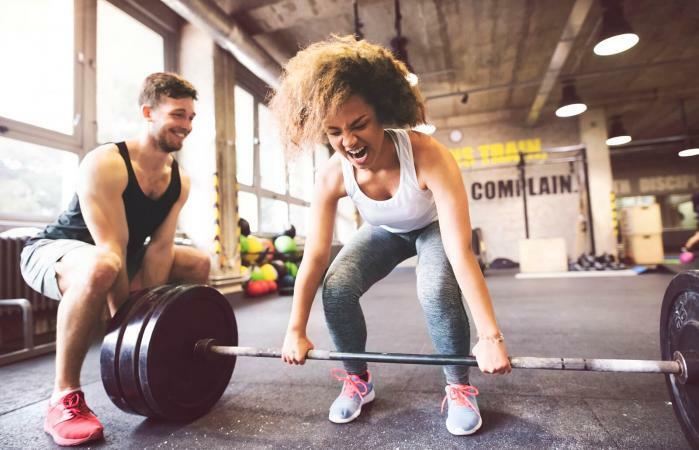 Anaerobic exercise is not about a specific activity, but rather the effort put forth and, more specifically, the energy system utilized by the body to do the activity. Those looking to do anaerobic exercise should consider activities where maximum effort is required. In other words, a person cannot simply do an activity listed here and assume they will achieve an anaerobic state if they aren't working hard and putting forth all the effort they can muster.